When you stay at Ambleside Luxury Bed & Breakfast in Nelson, you'll be near the airport, within a 5-minute drive of World of Wearable Art and Collectable Cars and Burrell Park. Featured amenities include a computer station, dry cleaning/laundry services, and multilingual staff. A roundtrip airport shuttle is complimentary (available on request). When you stay at this bed & breakfast in Orewa, you'll be near the beach, just steps from Orewa Beach and a 4-minute drive from Victor Eaves Park. Free self parking is available onsite. Located in Invercargill, Colonial on Tay is within a 15-minute walk of Bill Richardson Transport World and Rugby Park Stadium. Free self parking is available onsite. 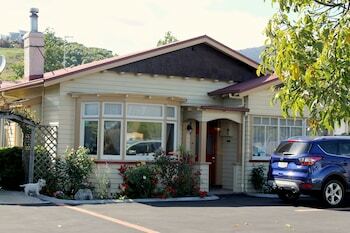 Located in Taupo, Fairbairn House is on a lake, within a 15-minute drive of Lake Taupo and Barbary. A roundtrip airport shuttle is complimentary (available 24 hours).